It's been a busy few weeks! Last week we had a little ice/sleet storm and the girls were out of school for three days. The girls were quite bored and since they were out of school and so were their cousins they were able to spend the night with them during the middle of the week. It was a nice break from staying inside our little grey house! But by Thursday Kayleigh was ready to go back to school. Not because she wanted to do some learning, mind you she missed all of her friends! 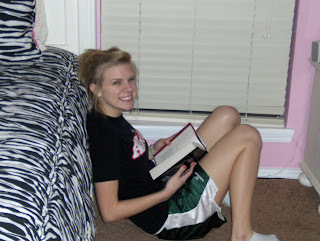 :) Kayleigh received the book Twilight for Christmas. She started reading it on Christmas day and is currently reading the fourth and last book in the series. Craig is quite thrilled to see his daughter READING! Kayleigh really isn't a fan of reading but she has so enjoyed this series. Kayleigh the reader A few weeks ago Maddie's school had a dress up as your favorite storybook character. 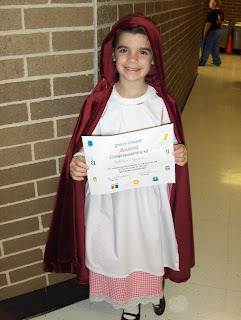 So she wore the Little Red Riding Hood costume Kayleigh wore when she was about the same age. I've been looking for the pictures I took of Kayleigh when she wore it but I can't find them! :( Maddie also received an award for knowing all of her vowel sounds. Please allow me to brag on Maddie for just a moment. A few weeks ago I was volunteering in Maddie's classroom. During reading time Mrs. Johnson spent a little extra time with Maddie. Later Mrs. Johnson told me that by the end of 1st grade the children should be on level 16 and currently Maddie is at a level 30! WOW! Now Maddie, she's a girl that loves to read! We're hoping she'll continue on that path! Way to go, sis! Fletcher is doing really well! He's been working on a computer with his speech therapist, Heather quite a bit lately. He really seems to like it. There are still a few challenges they're trying to overcome equipment wise. Fletcher's little arms are so short maneuvering the computer has been difficult. We're trying to get the screen close enough that he can touch it. We've tried him in his wheelchair and it just doesn't quite work. Heather has been sitting him in her lap but that still isn't giving him the independence he needs. But, if I know Heather, she's going to find a way to accommodate my sweet boy! Fletcher will be having surgery on Wednesday. The tubing on his central line has broken in two places. This line has only been in place since November 26th! That line should have lasted at least a year. 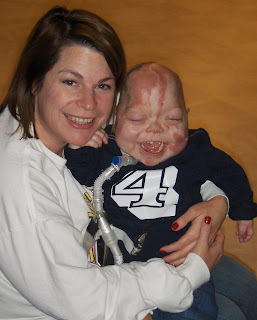 The tubing, which is on the outside of his body can't be repaired so he has to have it surgically removed and replaced! We're hoping that they can put a port in him instead of central line. But we've been down this road before and have been told he has too much scar tissue. It would be such a blessing if he could have a port. A port would be under his skin, you wouldn't be able to see it. I would love for him to have one less tube hanging off of his little body. Would you guys please pray for him on Wednesday? Thanks! During the ice/sleet storm I was stuck in the house and scared to take the risk to drive on the icy roads. The first day of the storm Craig came home and took me to TCC so I could see Fletcher. It's not very often Craig and I are there together. Actually that day one of the nurses came out of the unit she was working in just because she saw us in the hall. She teased us saying she didn't think she'd ever seen us together! Fletcher was in great mood and he enjoyed having both of his parents to play with. Craig and I do things so differently when we're with him. I basically hold him and read 12 or 13 books to him in one sitting. I have also enjoyed holding him in his bed in an upright position and letting him see what's happening. 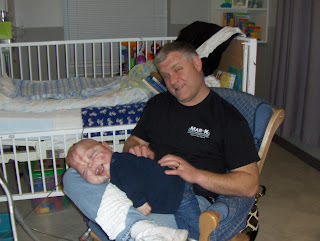 Craig plays with him the whole time and always wants to teach Fletcher something new. Fletcher doesn't let Craig hold him for very long periods. But when he does Fletcher loves for Craig to 'tickle' his back. Craig is the only one who can get Fletcher in the position he's in, in the picture below. Tonight we ended our day as family playing UNO. It was Maddie's first time to play and she caught on quickly. We all had fun laughing and just being together tonight. We need to make that happen more often it was good for all four of us! This video is from today. He's such a flirt these days! Enjoy! The Twilight series is amazing!! Kayleigh will enjoy it! #2 Twilight apparently has brought a lot of young girls to reading. I know about a hand full of people that hated reading but has now gotten into it all because of twlight! I'm still on book 1. But the movie got me into the series! Will be praying for Fletcher's surgery. I know you will keep us posted. Love you all! You had me! I thought you were going to pin Kayleigh as the flirt, but I should have known it would be Fletcher! Hey, are you all gonna be around for Spring Break? As of now, we are, and I thought it may be a great chance to meet up? Oh! I just went back and saw Fletcher's last video. He is ADORABLE and I have to agree with Toni's comment. So sweet how he just loves making you proud.